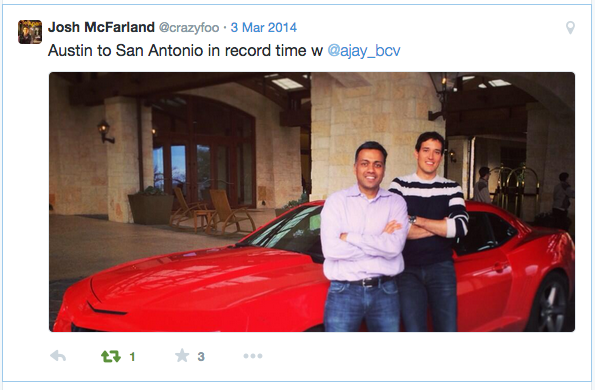 Today TellApart announced its acquisition by Twitter. We at Bain Capital Ventures couldn’t be more excited for founder and CEO Josh McFarland, his co-founder Mark Ayzenshtat, and the entire team at TellApart. Every startup journey is unique and in each one, the founder puts his own stamp on the company; this is especially true for TellApart. Josh started TellApart to bring data science and machine learning to the field of consumer marketing, long before it was in vogue. In a world in which 99% of website visitors look and don’t buy, TellApart’s solution helped e-commerce sites to “tell apart” the likely buyers from the ones who were unlikely to purchase. By applying data science to this problem, TellApart achieved tremendous conversion rates for its clients, often times 5-10 times better than the alternatives. The efficacy of the solution allowed TellApart to introduce a novel business model in the space. Rather than buying cheap ad inventory and charging a markup on those ad impressions, TellApart charged its clients nothing unless the TellApart ads directly led to conversions and incremental revenue growth. Due to the power of TellApart’s solution, built by our rockstar engineering team and supported by our amazing customer success team, the company has delivered exponential revenue growth from the day we invested. 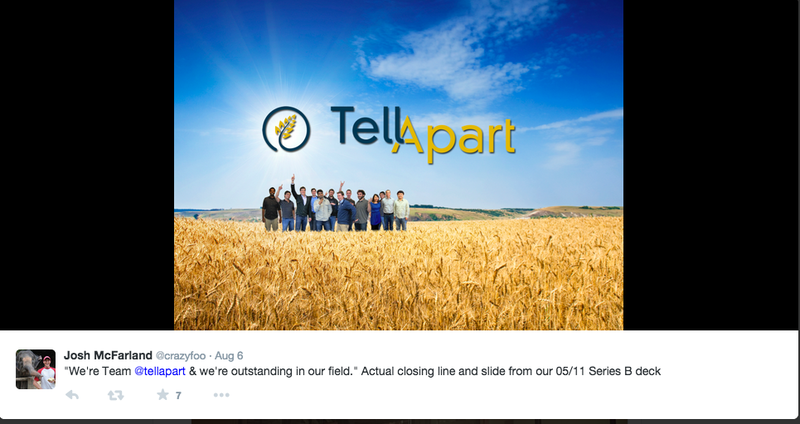 As a result, I don’t think TellApart spent much if any of the $13M round we led in July of 2011. Josh is from a small town in Wyoming and brought a little bit of the heartland to TellApart’s logo, which features a stalk of wheat. Despite being an incredibly fast-growing and high-performing Silicon Valley startup, TellApart has values that are more reflective of Josh’s small town roots: humility, treating customers and employees right, and making sure everyone wins. I repeatedly witnessed this throughout my time on TellApart’s Board: in customer negotiations, employee compensation discussions, or business model decisions, Josh always looked for win/win solutions. Many entrepreneurs in Silicon Valley feel they need to maximize every interaction but Josh always took the long view…one that in the end engendered tremendous loyalty and dedication from his customers, employees, and investors. The core of TellApart starts with our powerhouse engineering team that has created a solution used by the leading e-commerce companies in the world. Josh and his team, however, always combined the best of data science with the simplicity and beauty of a great aesthetic. Josh showed that in the world of consumer marketing, it’s a combination of art and science that’s required to persuade a consumer to take action. 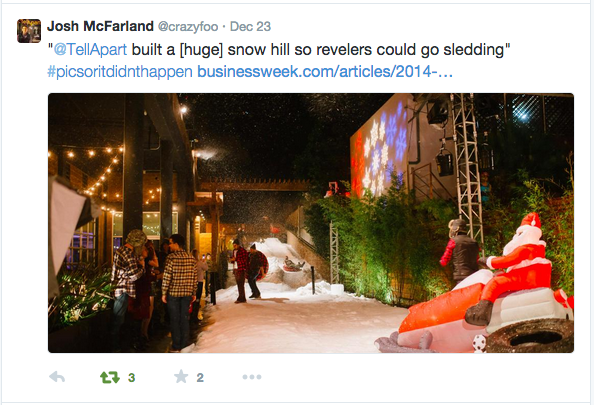 The targeting can be highly tuned based on great algorithms but the ads have to evocative and beautiful. 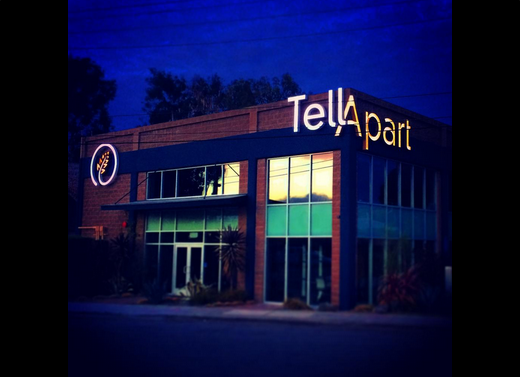 TellApart’s offices, its logo, and its company schwag are all reflections of the priority the company placed on design. This focus and attention to detail was prevalent across our ads, our emails, and any other impressions we served to our customers’ customers. I’ve had the pleasure of seeing Josh‘s sales skills in action in front of the hundreds of marketers we’ve introduced Josh to over the years. The data-driven results that Josh highlighted from TellApart’s solution were off the charts. But what always distinguished Josh’s salesmanship was his ability to connect with customers in an authentic and highly personal way. Josh displayed a genuine enthusiasm for his customers’ products – I think he owns merchandise from every single one of TellApart’s customers! Josh could clearly go “toe to toe” on the data and analysis with anyone on the planet, but what made him shine was his warmth, passion, and genuine focus on his customers and their businesses. This notion is true across the entire TellApart team and especially so with the fantastic group that worked and supported our customers on a daily basis. Josh has built a terrific team at TellApart and this amazing group is focused, dedicated, and extremely hard working. Josh himself sets the example by working tirelessly on behalf of his company and his customers. Despite the long hours and hard work, Josh made sure that he and the rest of the company took time to have fun and not take themselves too seriously. 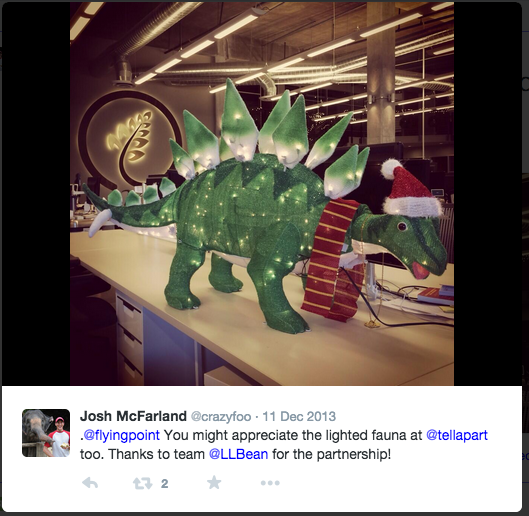 From company rituals such as champagne sabering to the annual TellAparty, Josh created a special culture – a place where people loved to work. This culture attracted great talent which in turn was the foundational competitive advantage for the company in an intense market for scarce talent. This amazing virtuous cycle started with the culture Josh invested in right from the early days of the company. Congratulations to the entire TellApart team. TellApart’s success is truly the product of many insanely great people working together to build a leader in the marketing technology space. I have no doubt this team will do great things at Twitter helping them significantly expand their direct response offerings. Thank you for all your efforts over the past many years. You are a special group of people and I am honored to have had the opportunity to work with all of you. Thanks, Josh, for letting us join in on this amazing ride and best of luck to you and the whole gang at TellApart on the next phase of the company!